Moving a company’s data warehouse to the cloud can be very tempting. The list of benefits and opportunities offered by the cloud is impressive. Any one opportunity, let alone the prospect of them all, from the following abbreviated list makes the shift to the cloud worth considering. 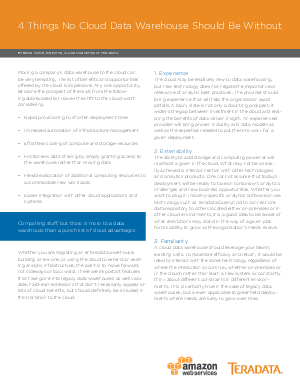 Read this article to discover the 4 things no data warehouse should be without.